I’ve been trying to get a handle on the weeds in the garden, which I swear was made completely out of invasives, since I moved in. Spot weeding didn’t do the trick, so I switched to a much more effective strategy to re-claim and throughly control a new section of garden every year. I started in the area around the patio, so I could have a weed free spot to enjoy while I worked on the rest. I’ve been prematurely patting myself on the back for getting this area so thoroughly weed free. This picture is from May 2008 after a yearly application of compost. Last week, when planting my spring plant sale haul, I hit something I’d completely forgotten about. Buried beneath 10 inches of compost, I hit synthetic weed barrier I had put down years ago in foolish desperation. I had been planting shallowly on top of it for all this time, which probably led to the unexplained demise of more than a few plants. All this led to an unplanned complete excavation of the area to remove the barrier and replace the soil, and replant everything, plus some new comers. A bonus was being able to cram in way more plants than I started out with. Plus, this area had grown shadier over the years as the bamboo grew in more densely, making it the perfect home for a bunch of shady characters I brought home the last few weeks. Things are probably too closely planted, but I’d rather move things later than look at bare ground all summer. One of my favorite newcomers is Astilboides tabularis. 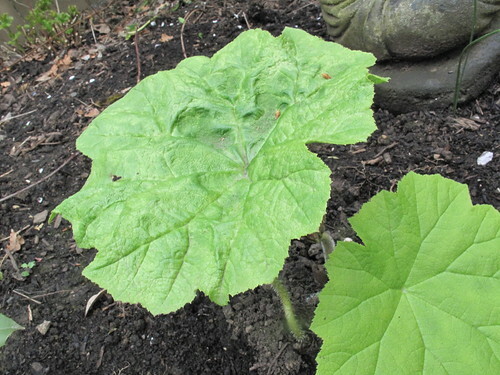 It may not look like much now, but once it grows to its mature size as a 6 foot clump with leaves 3 feet across, it’s going to be the star the patio garden. 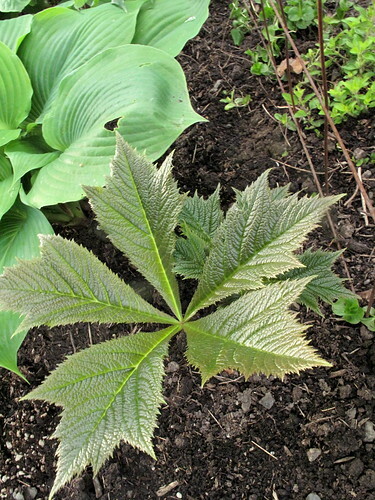 Another big leafed drama queen – Rodgersia podophylla ‘Rotlaub.’ It’s planted next to a relocated unidentified hosta that I believe/hope is ‘Sum and Substance.’ I can’t wait for the large leafed plants to all grow in. I’m looking forward to seeing what happens with Mukdenia rosii ‘ Crimson Fans,’ which is a new plant to me. It should be a low mound of glossy maple like leaves tinged with red, with orange/yellow fall color. 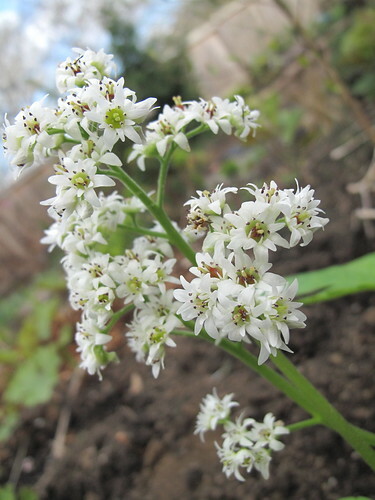 Mukdenia rossii does flower, but the leafless flower stems are not the star of the show. One of my three plants started blooming, the others may not this year. Impatiens omeiana should fill in as a ground cover, where I moved all the golden oregano out to sunnier spots. Now I read on Annie’s Annuals that it dislikes being crowded. Hmm. Love the post title; stupid gardener tricks. Yeah, we tried that trick once, with the weed cover. Not anymore. Here’s a question; Why does this post make me hungry???? I think it’s because your plant choices are so luscious! Well you certainly take the prize for getting in there and taking care of a prior mistake! A complete excavation is quite extreme, I hope you plants reward you with amazing growth. There was one planting area here that had horrible cloth landscape fabric put down. I should have dug and tore it all up as soon as I found it that first summer. Instead I’ve fought it for 5 years now. I think I’ve finally got it all. Evil evil stuff. We were told we should put it down in the front garden when we tore out the sod. So glad I ignored that advice! I am not a fan of the weed barrier cloth. The only time it is useful is when you are planting a bed that you NEVER change. I’ve had Astilboides tabularis for a few years now. I love it. It hasn’t gotten as big as it can, but it is definitely a welcome interesting specimen. Oh, I will never believe you again when you say you are lazy! That is a huge undertaking and I would have been quaking in my gardening boots at the prospect. I also did not realize the extent to which you have had to combat the weeds in all areas of your place. Wow, that sounds truly horrific! We have stupid weed barrier under our gravel paths (PO installation) and I hate it. The weeds come up through it anyway and it gets shredded and trips us where it gets exposed. Weeds are part of life, I guess, unless you bury your entire landscape under 6 in. of wood chips! Good for you for deepening the root extension area for your lovely plants. I almost bought a Rodgersia last weekend due to your posts… but held off because I don’t have the right space and it would probably die. Someday, maybe! Hey, what is that pink-flowered plant in the first pic, bottom right corner? Hi Megan, I’ve had the Mukdenia for a few years. 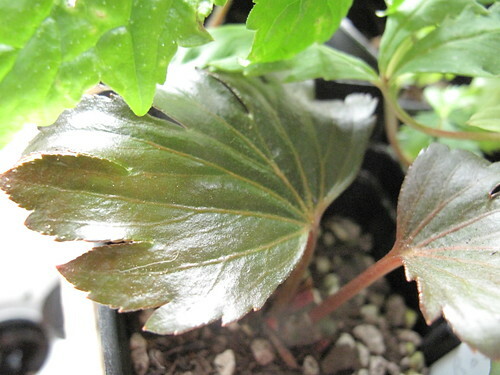 I’ve found that it needs a few hours of sunlight in order to develop the red tipped foliage. At least you had the nerve to dig out your erroneous weed cloth. I dig holes in it every time I want to plant something. Your border is just eye candy. 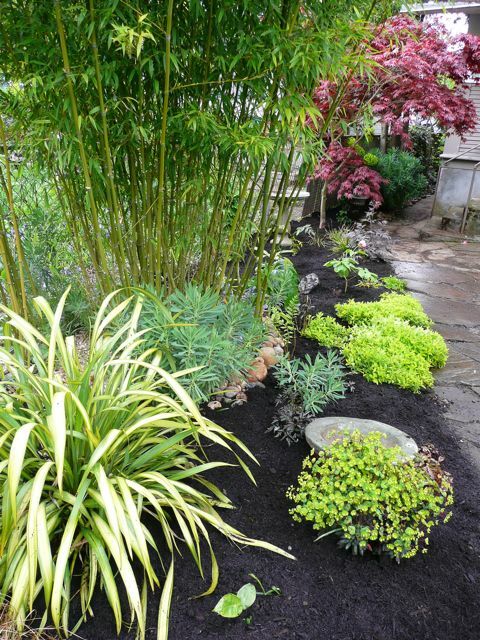 The lushness of your bamboo and the red maple… All very nice! Ohh the weed barrier cloths. I hate them! Worse are the cheaper plastic bag weed protector. Previous owners of my garden put them under the surface, and almost 6yrs on I’m still pulling them up! Your patio garden is looking fabulous! 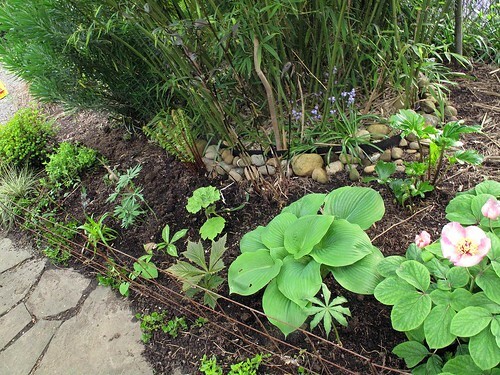 Victoria – it seems like every gardener has to go through the weed barrier mistake once. Loree – I have other areas where I’ve been pulling out the barrier piece by piece too. Miserable! Sylvana – I always hope for the biggest possible plant size, but the ones I’ve seen, like yours, aren’t as big as the 6′ claim, but it’s always still a knockout. Karen – Of course I would still say you should get a rodgersia, surely there must be a place? But then I have a collection of unplanted plants on my patio, so you shouldn’t take my advice. The pink flower is the allegedly white woodland peony that keeps changing colors on me. It went completely creme colored after a few days. Grace – Thanks for the Mukdenia tip, mine might need to relocate. Laura – Thank you! Those barriers will last forever. I’m sure some of my remnants will haunt me and future gardeners for the rest of time. Yup, you got it right on the title. Ha! Makes me kind of laugh (Sorry:). You know we all have our Eureka moments when we discover a major problem but honestly I must say, wasn’t it nice to remove the barrier and redo the whole bed? You’re probably thinking you need to to go look for some more weed barriers so you can rework more gardens huh? lol Looks great now. I have something similar to astilboides. It is petasites japonica and even though it is interesting it hasn’t expanded so much but maybe with time. We all have that in the garden. The roseii is really pretty. Does it smell good? You get the prize for major undertakings, Megan. But good for you for doing it right. I am constantly digging into the plastic mesh of turf both we and the PO installed here. We added our turf originally to define back garden beds that I’m now enlarging and freeing from grass, but that stupid mesh is a real pain whenever I encounter it. 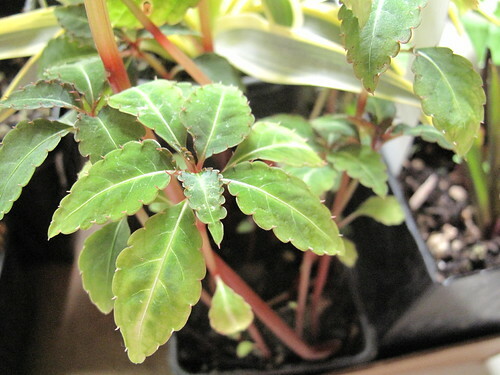 As for your impatiens: a ground cover that doesn’t like to be crowded – what’s up with that? Hi Megan: I’ve had Impatients omeiana in my garden in Beaverton for a few years now. It likes bright shade and some summertime watering. If it’s not crowded, it will spread very well without becoming invasive. Enjoy it for the foliage; the flowers I’ve seen are fairly insignificant.